There’s nothing like the dependability and reliability of these high quality Spectrum Labs synthetic urine Heating Pads. They’ve been uniquely designed to keep your synthetic urine at a temperature that will pass with flying colors. The lab has designed these specifically to work with Quick Fix bottles to ensure the product is never over heated nor too cold to submit in a lab facility. Preparation when using the heating is quite simple. 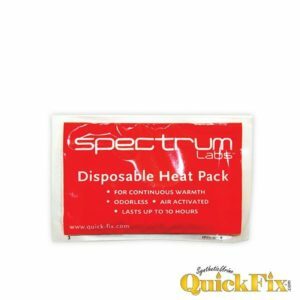 Open the Spectrum Labs synthetic urine heating pad and shake vigorously for fifteen seconds, Once the chemical formula in the heating pad is mixed it is activated and it begins the heating process. The synthetic urine heating pad is designed to keep your bottle at an ideal 96-98 degrees while it is attached to the urine sample with the provided rubber band. You will get a full eight to ten hours of consistent heat once the pad is activated. If you live in a warmer climate you may want to remove the heating pad if it is stored under your clothes or in your underwear as it may get to hot. We only recommend you remove the heating pad if you are a minutes away from walking into the testing facility to take your urine screening. If you live in a cooler climate you may want to keep the sample close to your body in a pair of boxer briefs or for females your bra. Every Quick Fix synthetic urine kit comes with one factory heating pad. Additional heating pads may be purchased on our site for a small fee. All labs in the United States must adhere to DOT testing standards, this means any urine sample can be turned in between 90-99 degree Fahrenheit range and the heating pad will keep it right in range. The heating pad was also designed not to burn human skin but it may become uncomfortable with direct contact. If the heating pad it placed in the underwear or bra area it will not hurt you for extended periods of time. From time of manufacturing Spectrum labs approved heating pads have a full three year shelf life and can simply be stored at room temperature for future use. Knock off heating pads may be purchased at local shops but may not work the same. Companies such as Little Hotties and Hot hands hand warmers have popped up in many online forums as an alternative to heating synthetic urine bottles with mixed results. We recommend you stick with the professionals on this one a throw a few extra in your cart upon checkout. Store in a cool dry place, keep the package sealed until ready to use.